A pain scale is typically a visual method that allows you to systematically track your pain, its intensity, and other symptoms. They’re often based on cartoons or numbers. These scales can be self-reported verbal rating scales, as in you explain your pain symptoms according to the measurement given. They can also be judged by behavioral or observation (especially in the case of kids or people who are unable to speak). 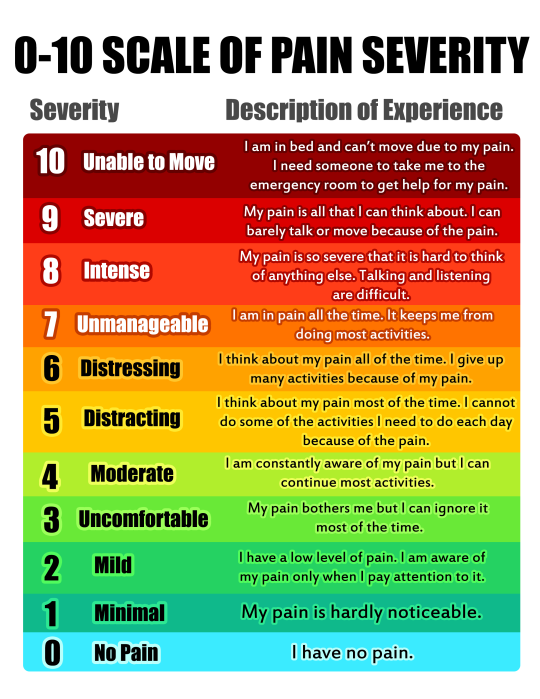 Pain scales are an excellent way to better share how you’re feeling with your doctor. They can help you get a better diagnosis and treatment for your pain. Here’s 15 of our favorite pain scales, with advice at the end for finding the best one for you to use. Pain assessments and scales are the best way to communicate with your doctor what you’re feeling and how bad your pain is. And they can track your pain day over day, especially when used in combination with a pain diary app or journal. They can be a scale from one to ten, with ten being the worst pain imaginable and one being no pain at all. These scales can also rely on visual indicators or facial expressions to judge pain. Or, they can be personalized interpretations of how pain affects you in your life, always there in your pocket with a pain app like PainScale. But, as always, pain is subjective. You have to find a pain measurement that works for you, consistently and easily. Seddon R. Savage, MD, incoming president of the American Pain Society and an adjunct associate professor of anesthesiology at Dartmouth Medical School in Hanover, N.H. explains how to conceptualize the top of your pain measurement. We’ve pulled together a list of 15 of our favorite pain scales to help you get started. The right one will be very accessible and will just “fit.” It will make sense to you and how you experience pain. Remember, a pain assessment scale is just a tool and it must work for its user. If a one to ten scale doesn’t help you explain your pain, a color scale for pain or facial scale might. We’ll cover each of those in more detail in this post. The most common scales for pain encourage the patient to identify their pain between one to ten. 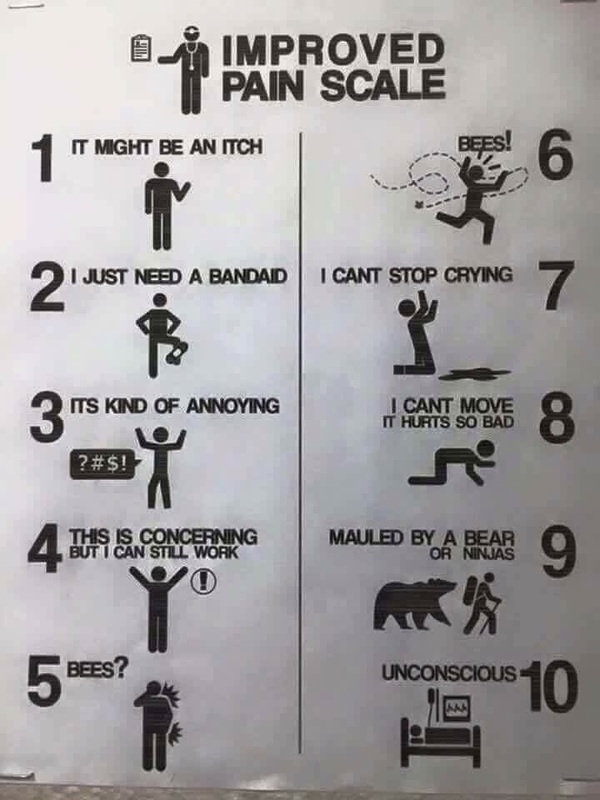 If you’ve been to a doctor about your pain, you’ve likely used this scale before. This scale is simple, it’s effective, and it works for many patients. However, the scale can be limiting to other patients who don’t quite understand what a six means versus an eight. And it’s frustratingly subjective, meaning that different people will have different scores within the scale itself. And different doctors will interpret your answers differently. The Stanford version of the pain scale from one to ten, however, goes a good way towards clarifying this pain measurement. A scale that relies on faces can be incredibly helpful when diagnosing pain in children. But it can also go a long way towards helping your pain doctor understand the level of your pain during a visit. The faces pain scale that many people are familiar with is related to Wong-Baker’s FACES® pain rating scale. As you can see, it uses a one to ten scale to judge pain and then correlates facial expression with that. However, this common scale for pain may not be descriptive enough for most patients and it’s typically not helpful for patients with autism. While it’s used by doctors to assess pain, it’s also a great tool for you to use to track your pain every day. It only takes a few moments to answer the questions and can give you a quick overall score to determine if your pain is getting better or worse. A visual analogue scale, or VAS, is a tool that dispenses with numbers for measuring pain. It recognizes that many patients don’t experience pain in discrete units like numbers, but in a variable way that exists on a sliding scale. A pain VAS allows patients to mark their pain intensity on a continuum. Most are straight lines of a fixed length, though some can have middle points or meter-shaped scales. If you suffer from CRPS, the McGill Pain Index may provide a better way to track and explain your pain. Instead of fixing pain intensity only to a number, it compares it to other injuries or types of pain to help quantify it. It incorporate sensory qualities, affective qualities of pain, and evaluative issues to help pinpoint the intensity of pain. The Index, first created in 1971, continues to be a very valuable, reliable, and useful way to measure pain and it’s the leading CRPS pain scale. The Mankoski pain scale incorporates a numerical pain scale, along with brief descriptions, to help categorize pain. It goes one step further though and explains that pain in relation to how pain medicines either help or don’t help the person’s pain. Color pain scales are, like many on this list, another way to help children judge their pain levels. But for many who are visually-inclined, colors may also represent a really powerful way to associate and understand your pain. For children, this scale is usually shaped like a thermometer, with darker red colors indicating more pain. The Oucher pain scale is another tool that was used to help children communicate their pain. 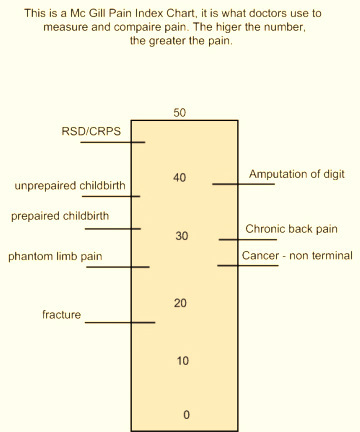 It uses a number scale for older children and uses pictures for younger children to point to explain their pain levels. Likewise, the FLACC pain scale uses a younger child’s facial expression, leg movements, activity, crying, and consolability to categorize the child’s pain. Like the Hyperbole and a Half pain scale, some pain patients have created their own scales to evaluate and categorize their pain. These range from amazing color-coded diaries to humorous takes on pain. 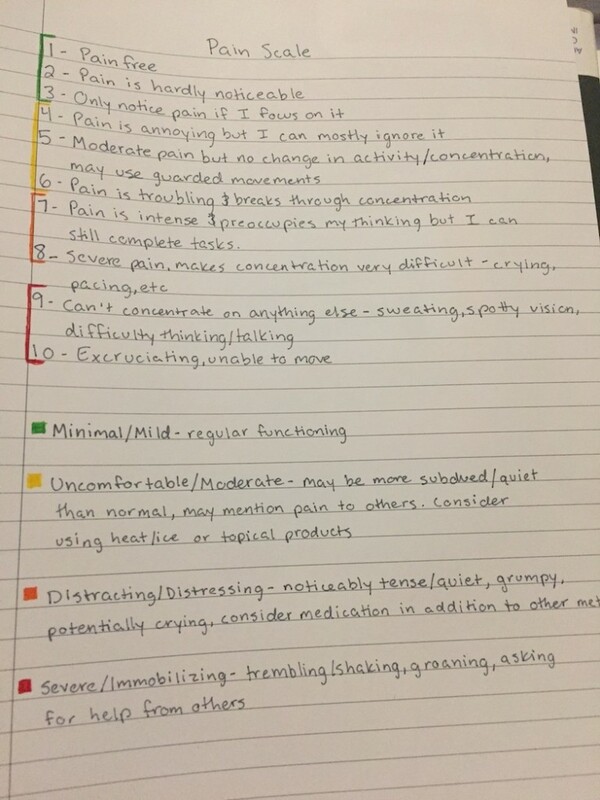 This numeric rating scale was shared by a fibromyalgia patient and uses both colors and physical descriptions to help them categorize their pain. By using something like this consistently, you can help better explain your pain to your doctor and track how it’s feeling on that day. This pain inventory allows someone to talk about when their pain is mild or requires urgent critical care. For some patients, explaining the type of pain they’re experiencing is best explained by talking about how the pain feels, not to what degree. This written scale incorporates descriptions for types of pain ranging from industrial pain to cramping pain to spasms. This pain scale uses humor to showcase how a person is experiencing pain. It’s largely silly, but is a great way to get the conversation going about your pain. Even though this scale is similar to many of the others on this list, we thought it was important to show that yes, you can and should create a scale for pain that works for you. It doesn’t have to be fancy. 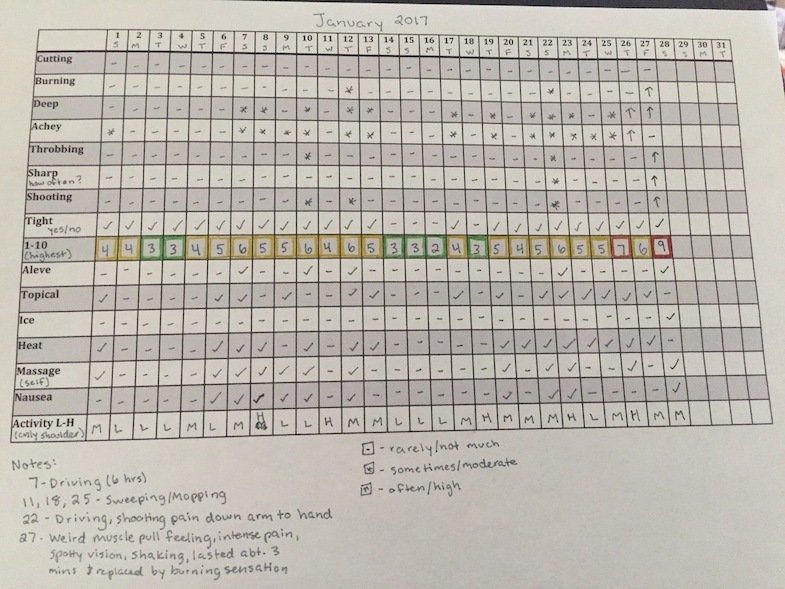 This pain inventory helped this patient accurately track their pain according to how they were feeling and how their pain affected them. This same patient then used a daily tracker to monitor her pain levels. You can see a great example of that in the image below. For visual people, this is a fantastic way to quickly understand and see pain changes over time. A scale that actually works is the best pain scale there is. To that end, the Randall Chronic Pain Scale is a tool for putting your own words to a personalized scale. It uses a numeric, color-coded display to help you track and pinpoint your pain that day, while asking you to describe exactly what each of those ratings mean to you. Then, once you have it put together, you can use it going forward. How to find the best pain scale for you? As noted at the beginning, pain is subjective. Accurately reporting that pain to a health care professional can be difficult. We believe that creating your own scale can help you better pinpoint exactly how your pain is affecting you and what it feels like. Overall, we suggest using one of the clinical models that best resonates with you, whether that’s a series of direct questions like in our global scale for pain or a visual representation by colors. You can also create a hybrid scale that incorporates multiple measurements into one (like numbers and colors). Then adapt it for your own benefit. Use color and humor and more specific descriptions as you see fit. You can find a longer list of clinical scales in use here. You can avoid some of the pitfalls of using a pain assessment by following the advice on ProHealth for fibro patients. Make a scale that works for you, and you’ll be much more likely to use it. And, when it comes to seeing your doctor for help in treating your pain, they’ll have a lot more information to work with. 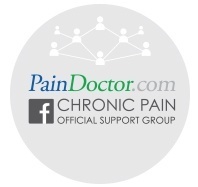 To get started on your own journey towards diagnosing the cause of your pain, and getting treatment for it, click the button below to find a certified pain specialist in your area. Excellent info! Loved the creative graphics and personalized versions! I’m so glad to find theses scales. I’m going to use the one that describes what you can and can’t do because of pain. I will show it to my doctor. Thank you for such good information. I’m an elderly person with chronic pain, so it is very necessary to describe my pain well to get the appropriate care. I am wondering if I would be able to use a scale (specifically number 11 color coded pain scale) for an accurate description for patient pain within our clinic? Is this image copy written and if so how would I go about obtaining permission to use the image? Typically, it won’t have a copyright, but you still may want to alter it for your own clinic or talk to the image owner to double check. Hope that helps! I was wondering if I could use your image under “13. Humorous scale for pain” in a powerpoint presentation on pain scales. Is this image copy written and if so how would I go about obtaining permission to use the image? Thank you very much! I enjoyed this post. Typically, however, fair use allows you to use images for educational purposes, but you still may want to talk to the image owner to double check. Hope that helps and thanks for your kind feedback! Most people don’t understand the real pain till you have CRPS. It took 5 years till a doc even believe me they all said quit self diagnosing your self. I live in chronic pain. I once went to the ER with a kidney stone. They asked my pain and I called it a 7 or 8. They asked me what a 10 was and I said “death or dismemberment” They asked what child labor was, and I told them an 8, maybe till the end. They laughed and said that I was at a 10. Chronic pain patients are often accused of over exaggerating pain, but in all actuality the opposite is often true. Thank you for sharing your insight here! 11 and 14 are definitely my favorites because they give you some objective criteria by which to judge the pain. (15 may be good as well, for the same reason, but it is not thoroughly explained here.) What am I supposed to do when looking at a list of faces, having never experienced a bone fracture or severe burn, let alone giving birth? I don’t know how those completely uninformative face scales got so popular. I can read 11 and 14 and reasonably determine that when I was at the height of having trouble with this weird leg pain initiated by dehydration, it would spike up to around 7-ish. Fortunately, it was 0 between the brief episodes. My best guess with the “lol whatever” scale was a 4, because I had no experience with anything higher. What Kira says makes sense to me as well; people who are experienced at dealing with chronic pain will probably be able to concentrate through it more, which lowers the rating on the scale. Still, it’s much better to be able to measure it by “how does it affect you”, rather than “what face do you feel like”. Thank you for sharing your insights here! Thank you so much for sharing this article about pain scales. I really like this idea and it could be useful to kids too!